Even though you’re probably an adult and way past your childhood, cartoon still comes into your life occasionally. Once in a while, we would indulge ourselves in cartoon-binging, especially when we can find anything good on Netflix. When you’re watching a cartoon with your children, niece, or nephew, you secretly like it. No need to be ashamed! Who doesn’t enjoy a cartoon? They’re funny, cute, and entertaining. Now, how about some Russian cartoon? Some of us who are currently learning it might consider watching Russia cartoon. Let me tell you: it’s an awesome idea. The reasons being, cartoon uses simpler language, hence you won’t have difficulties understanding complex dialogue. They’re for children after all. The simplicity is perfect for a beginner language learner. Second, cartoons are fun. Especially certain Russian cartoons (have you ever heard the ultra-popular Masha and the Bear?). Learning Russian with cartoon makes the whole thing doesn’t really feel like studying. Time flies while watching cartoons. Don’t get carried away and forget your learning though, keep your focus. Cute, cute, cute. One word “cute” is not enough to describe this cartoon. Look at the main character, little girl Masha with her pink scarf, little blonde bang, and cute little Russian dress. The first-time audience shall fall in love with her in the first place. Don’t get mistaken though, watch for some more and find out that little Masha can be mischievous, such a trouble maker annoys her friend The Bear who happen to be so unlucky being in vicinity whenever Masha doing her antics. The duo’s interaction can be very hilarious to watch. Their friendship, between a scary but good-hearted Bear and a little human child, is heartwarming. Although Masha can be very annoying sometimes, she has a kind and caring heart. As it summed up from the show’s tagline, “with kindness and comedy, follow the adventure of Masha and The Bear”. The show does emphasize two things: A good message for children and humor. Masha created base on Russian folklore about a little girl and a fatherly bear. It’s one of the most popular cartoons in the world currently. Since its creation in 2009, the show has garnered billion of views on YouTube alone. One of its videos is the most watched video of all time. In 2016, Netflix acquired the rights to distribute it in their platform. In 2018 Netflix acquired more two cartoons. One of them is Leo and Tig. The characters are a little tiger who makes friend with a little leopard. The gang doesn’t get limited to just the two of them. There’s Mapa the Himalayan black bear, Yara the lynx, and Mila the weasel. Each has their own quirk and it’s interesting to watch that the character has a distinct personality from each other. Just like Masha and The Bear, the theme of this cartoon is not far from friendship. How to tackle your daily problem and obstacles together. Nature plays a great role too in this cartoon. Viewers will be invited to join the character’s adventure and get to know the nature where they live. The setting for this cartoon is Russia far east specifically at Altai mountain region. Don’t let the title fools you, Be-Be Bears is not only about bears. Other animals also make an appearance in this cartoon. The brown bear is called bucky, the polar bear Bjorn and Littlefox which is a, well, fox. 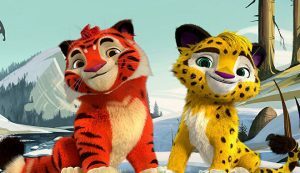 Just like Leo and Tig, these animals friend also has a unique personality and interest for each character. Be-Be Bears follow the adventure of the three and sometimes accompanied by other friends too. The main theme is friendship and nature. Follow their curiosity as they explore nature in their surrounding. It’s a lighthearted cartoon you can watch at Netflix should you’re done watching Masha and The Bear and you want another bear-themed cartoon. Are you familiar with cartoon Winnie The Pooh from your childhood? Well, be delighted because there is a Russian version of it. Called almost identical Vinni Pukh, the bear here is not yellow, unlike the American version. It’s brown, like a truly Russian bear he is. He’s not cute, but rough and strong. Once again, like a truly Russian bear he is. Vinni Pukh is not intended as the copy of the Disney version, although they are both based on the same book. Vinni in this cartoon even has the same circle of friends as Winnie. The donkey Eeyore, the pig Piglet, and the owl (only the owl is a she). Another difference is that there’s very little Christopher Robin here – he’s almost nonexistent. You can watch this version of Winnie The Pooh at Buzzfeed. 2. Well, Just You Wait! After Winnie the Pooh, the next Russian cartoon who is similar to what America has is Well, Just You Wait! This one mimick the popular Tom and Jerry. However, the main difference is the animal used as the characters. Instead of cat and mouse, viewers are introduced with the wolf and the hare. Well, Just You Wait is one of the most-loved cartoons in Russia. It’s been entertaining viewers for five decades since 1969. If you’re wondering, yes, the cartoon is as “violent” as the American Tom and Jerry. For your language learning, this cartoon has short dialogue, so you won’t have many difficulties with the words being spoken. Apart from cartoons, watching Russian movies can also be a good idea to amp up your Russian skill. Another way is by reading a Russian book. Now to think about it, there are plenty of fun and effective ways to learn the Russian language.